Discrete Event Simulation is a portal to the future: find constraints, test strategies to break them, improve performance to the goal, maximize investment returns, and reduce risk. Shown below are three powerful simulation output reports. Time in State. Time in state simulation output reports are especially useful in finding the constraint in the process. Before the constraint, machine elements are generally blocked (blue) more than they are starved. After the constraint, they are starved (yellow) more than they are blocked. The machine element with the most uptime (green) is likely the constraint. Knowledge of the constraint’s location is a key factor in improving the process. Focus on the constraint for opportunities to increase throughput. Look to non-constraints for opportunities to reduce operating costs. Volume Histogram. 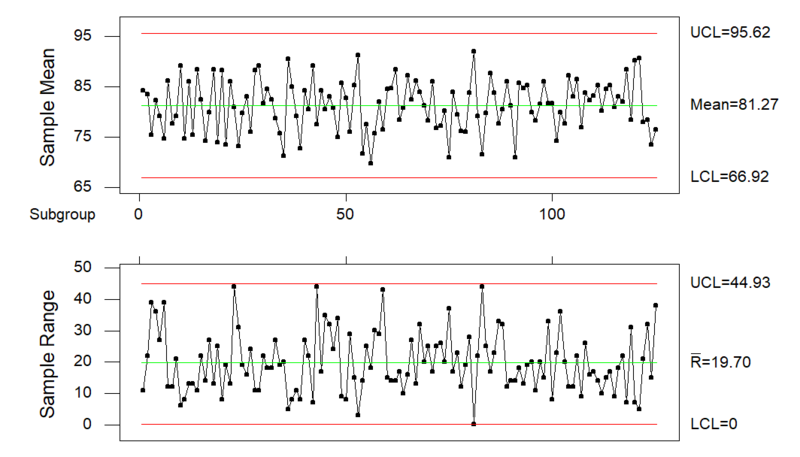 The volume histogram is the first to two methods used to validate a simulation model against its real-world process. How production counts vary over time is an important metric…the less uncertainty the better. The volume histogram provides a qualitative comparison of the hour-to-hour variation in volume throughput. X-bar & R Chart. The production count X-bar & R chart provides a more quantitative comparison between the simulation and the real-world process. Statistical process control charts not only quantify the magnitude of the common cause process variation but also identify special cause events. Characterizing the output variation as common cause vs special cause is an important factor in validating the simulation model. It is difficult if not impossible to simulate special cause events. That is because discrete event simulation “engines” utilize constant probability random number streams. If the real-world process variation is being driven by non-random events, then the root causes of the special cause events will have to be removed before the simulation what-if results will predict future performance. These three simulation output reports are the foundation for a Plan-Do-Check-Act continuous improvement of the simulated manufacturing or business process. Simulate, validate, and experiment. A robust solution will follow. Discrete event simulation provides a dynamic view of the value stream as well the ability to run “what-if” experiments to predict the effectiveness of changes. As such, discrete event simulation is a very powerful tool to maximize operational and investment efficiency and to find robust solutions that mitigate risk. 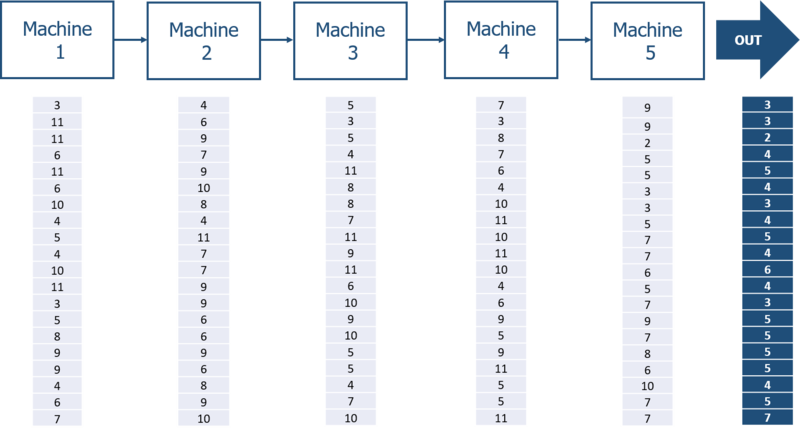 A discrete event simulation is built by connecting modeling elements (machines, conveyors, buffers, parts, people, etc) in the process flow logic. Next the performance of each element is described with variables such as cycle times, downtimes (MTBF or MCBF and MTTR), changeover times, conveyor min/max/floats, buffer sizes, shift times, etc. A Value Stream Map organizes most of the data required to build a discrete event simulation model. Uncertainty in any performance variable can be captured by fitting a probability distribution around a mean value. For example, a cycle time might average 60 seconds but vary between 54 and 66 seconds. This variation is simulated by sampling the appropriate probability distribution with a random number stream. By using a different random number stream for each probability distribution, the events in the model are independent of each other…just like in the real world. At a constant time interval, the simulation software “engine” assigns a random number to each element in the model. Next, all the elements try to advance one step. Then the elements all report back on their status: up, down, blocked, starved, etc. 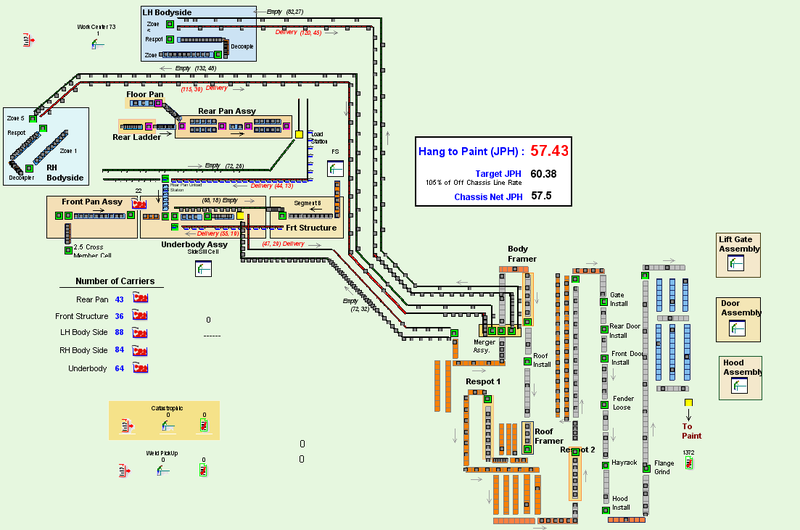 The simulation software notes the status of each element in the model and then repeats the process over and over until the experiment is complete. At the end of the experiment, the discrete event simulation software collates the results and generates the desired reports. What-if experiments are easily performed by making changes to the input data set (typically an external Excel spreadsheet) and then re-running the model. 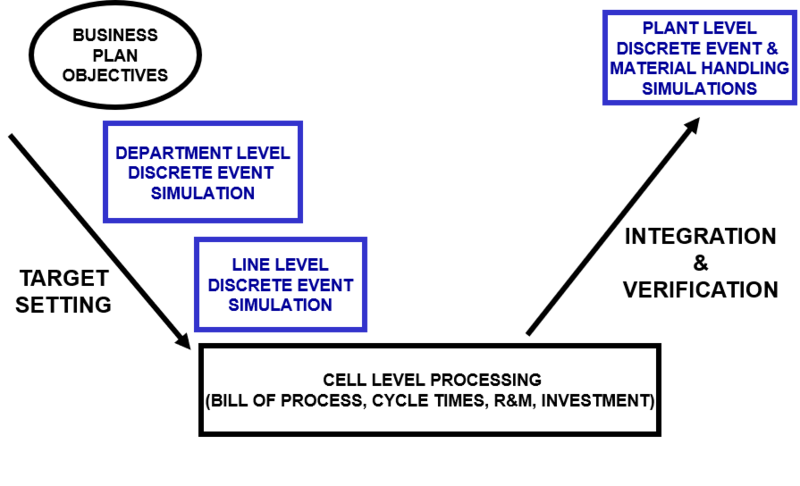 Discrete event simulation is a versatile tool equally applicable to both manufacturing and business processes.